On Shrove Tuesday/Mardi Gras/National Pancake Day, my son's school hosted a Read Across America Celebration/Family Literacy Night. Whew! With all those words, it was hard to slip a bite of pancake in edgewise. Of course, the school celebrated with a pancake-themed book. We were treated to a reading of Laura Numeroff and Felicia Bond's If You Give a Pig a Pancake by actor Gary Cole. 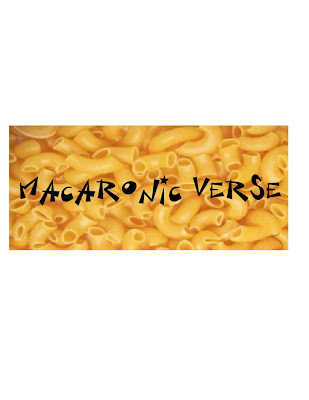 Groups of students also read pancake-themed poetry by Shel Silverstein and Jack Prelutsky. As for our esteemed reader, talk about class. This was no read-and-run event for Mr. Cole. He stayed the entire evening to eat dinner, sign autographs, and mingle. Bravo! I applaud the teachers, parents, students, and school staff for planning and organizing such a wonderful event. I only wish this could happen more than once a year! This room is all about roundness. With a window like this, why not pull out a submarine picture book and imagine away! The size of this library's menagerie almost matches that of the L.A. Zoo, which is just a short trip away across Griffith Park. Spend a morning at the Zoo and come here to read more about your favorite animals in the afternoon. You don't have to trek through the L.A. Zoo's Botanical Gardens to enjoy Mother Nature. Relax outside the Los Feliz Branch Library in the company of some architecturally-pleasing plants. I'm a sucker for succulents! This may be a small library, but it's bustling with activity. Take the kids here for LACMA-run art classes, Mother Daughter Book Club, Boys' Book Club, Baby Mother Goose Storytime, Toddler Storytime, Preschool Storytime, Teen Anime Club, or Teen Book Club. Adults can choose from the Book Club, Book Gossip, Chess Club, Scrabble Club, Quilting Circle, Architecture & Beyond, and the Family Art Class. You get the idea. This is a vibrant book-loving community. What are you waiting for? Come on by and see what's happening. Situated in the Highland Park neighborhood of northeast Los Angeles, the Arroyo Seco Regional Branch of the Los Angeles Public Library is a beautiful Arts & Crafts destination for book lovers. Additional photos of the library can be seen here. Remember the amazing library mural we featured on the blog recently? This is where it lives. The above photo features the Children's Room. It almost looks too tidy, doesn't it? Send some kids, quick! Here's the "storytime room," complete with a classic Arts & Crafts rocker and a cute child prop. This is a totally staged photo. I directed the cute child prop to color-coordinate his outfit to Goodnight, Moon. Well, not really... but it worked out nicely, huh? Conveniently, a park lies adjacent to the library. When you need to slide even further into your imagination, here's the place to do it. Currently, the Arroyo Seco Regional Branch Library features fortune telling classes for adults and LACMA-run art classes for kids. I suppose these programs really go hand-in-hand for those parents who want to divine if their child will be the next Rene Magritte. Hmmm... maybe that's not such a bad idea. 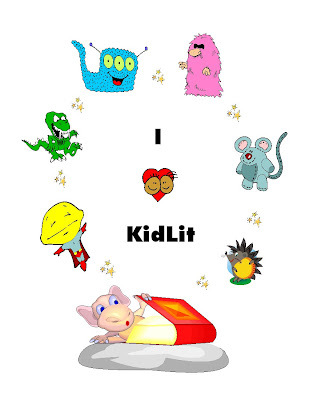 In honor of the Kidlitosphere's "We Love KidLit!" Blog Carnival of Children's Literature this month (which challenged a multi-media entry), Sudo Nimm created the above image. Need we say more? Check out the rest of the Carnival starting February 27th by clicking here. My son and I were reading Eric Carle's The Grouchy Ladybug recently, when a random question struck me. As a reader, I wondered what the difference was between experiencing a scene as multiple, double-page spreads, or as a gatefold. Let me set the stage. In The Grouchy Ladybug, the eponymous insect meets various animals throughout the day and tries to pick a fight with each one of them. At "five o'clock," he meets a whale. The massive mammal doesn't respond to the insect's provocation, so the ladybug "flies on." The grouchy ladybug then attempts to pick a fight with the whale's flipper and fin, but to no avail. By "a quarter to six," he reaches the whale's tail, and you either know what happens next, or you need to read it yourself to find out. In any case, what fascinated me was the 45-minute flight the reader shares with the grouchy ladybug across the whale's body. Executed as a pair of gatefolds, this scene would have ably expressed one of the concepts explored in the book-- size; yet, executed as 4 double-page spreads, the scene expresses size and another important concept explored in the book-- time. The use of 4 double-page spreads in The Grouchy Ladybug helps the reader to not only "take in" the size of the whale, but to also experience a sense of the 45 minutes it took the ladybug to fly the length of the whale. The page turns create a momentum of forward motion. And where there is motion, there is time to measure it. Because the multiple, double-page spreads prevent the reader from being able to see the whale "all at once," there is also the effect of creating a sense of time having passed. The reader would have to go back to an earlier time, by turning the pages, to be at the "beginning" of the whale physically and temporally. Finally, the use of multiple spreads makes the whale's size seem even larger, because the imagination has to piece the spreads together to form a complete mental picture. As a result, the whale's size can only be limited by the imagination of the individual reader. 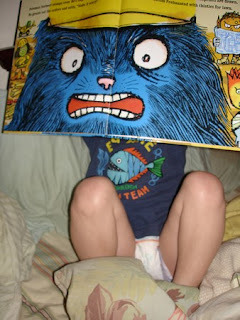 The Grouchy Ladybug's use of multiple page spreads, instead of gatefolds, demonstrates the power of picture book design as an important, if somewhat "hidden," element of a picture book's text. And any addition to a picture book creator's arsenal makes even the grouchiest ladybugs smile. In 1995, muralist Luis Becerra created Libraries Educate, Government Makes Cutbacks on two exterior walls of the Arroyo Seco Regional Branch of the Los Angeles Public Library. Above is a detail of the mural depicting poet Maya Angelou. In 2003, a new library was erected, and the mural was moved (i.e., two exterior walls) to its new location at the west end of the current library's parking lot. Click here to see images of the mural in its original location. If you live in Los Angeles, or plan on visiting someday, put this mural on your list of must-sees. Besides, the Arroyo Seco Regional Branch Library is an architecturally-pleasing destination in and of itself. Click here to see photos of this Craftsman style library. especially in a world that favors controlled thought over free thought. I'd love for the above image to be on my library card! The next generation takes it in. Are there any library murals in your community? Comment and let us know. Thanks! It even came with roses on the screen! In all honesty, I've been coveting this monitor for months. When I recently discovered its clearance sale status, my hubby had to look no further than Office Depot to make his wifey uber happy. P.S. Check out the love that's overflowing in the Kidlitosphere today. The Cybils have been announced. Click here. Allergic to cats? Love cats, but can't keep them in your apartment? Want to prepare your child for the fun of owning cats? 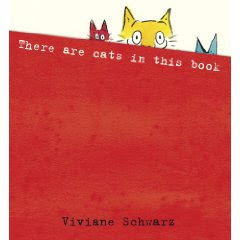 Then, here's the book for you: There Are Cats in This Book by Viviane Schwarz (Candlewick Press). A novelty book that delivers (sadly, many don't), There Are Cats in This Book keeps readers busy following the playful requests of Tiny, Moonpie, and Andre. My son nearly threw the ball of yarn off the page! "What? How's that possible?" you ask. That's why you've got to pick up this book. The ending also sets this up as a purr-fect bedtime companion. "P.S. There are fish in this book, too." And I must say that they are gorgeous. If you're part of a KnitLit group (it's a kniterary literary thing), then you can knit the cats from this book by clicking here. Want to see what else the talented Ms. Schwarz is up to? Click here. I went to a writing doctor months ago, and what did he prescribe? Sulfur, ChRomium, Iodine, and BEryllium." I followed his advice, and now I take them with me wherever I go. I can describe anything now. Thanks, Doc! What's on your writing bag? The Montrose-Crescenta Branch of the Glendale Public Library is a cozy little spot located on the west end of the Montrose Shopping Park. Adjacent to a fire station, the library ties in nicely as a follow-up destination from a firehouse tour. Maybe even search for some fireman-specific picture books? The above photo features the Children's Department Reading Room. This friendly giraffe sees if library patrons "measure up." The little guy passed inspection, thankfully. Three baskets of eager puppets await flights of fancy. "Any hand will do." This little guy is a letter herder. His job is to help collect all the letters that have fallen out of picture books. He makes about $932.00 a day. I'm clearly in the wrong business. This treasure map may be the single most important reason to visit the Montrose-Crescenta Branch Library. Normally guarded fiercely by the puppets, this letter herder ably captured it from their secret cranny. Only the true of art can follow its precipitous paths to untold treasures. The letter herder receives special sonar transmissions from a pod of Beluga whales, who may have an inkling of where the treasure is. Stay tuned... or, better yet, visit your local library today to find treasures of your own! 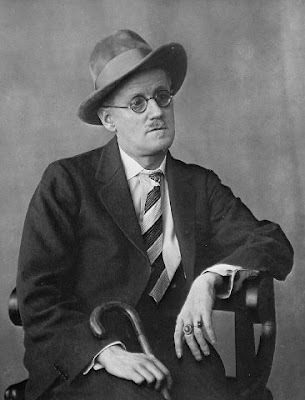 You may have left us in your wake, but not before you made all of us Finnegans Wake up. Thanks to you, Finnegans can have fun again, because language is not languid. And when you saw lengwhich, like Molly, you said yes, yes, Yes!